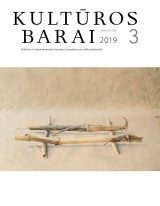 Kulturos barai is an independent monthly journal of culture that regularly covers wide cultural areas: general cultural topics (cultural theory, history, and criticism), art, theatre, music, dance, film, architecture, cultural tendencies abroad, etc. It is published in Vilnius, Lithuania, and has a circulation of 3000 copies. The journal aims at discussing the most urgent issues in Lithuanian culture, with a broader perspective of cross-cultural developments. It publishes articles and essays of leading Lithuanian and foreign cultural critics, social thinkers, philosophers, sociologists, historians, and members of other academic/intellectual communities. Reviews of the most important books on cultural topics, published in Lithuania, are included in each issue. Regular overviews of cultural life in the western world are also being published. Round-table discussions about social and cultural problems (for example, reform of academic institutions, European integration, the state of cultural policy, social aspects of drug abuse, etc) are an important part of the journal’s profile. The journal’s policy is to bridge public and academic space, a goal which is considered to be one of the most important aspects of humanities, thus academic essays of well-known and young Lithuanian authors are welcome alike. It is also maintained that culture is an open area, thus the journal always welcomes critical responses to the issues discussed on its pages. Boom or bust time for critical thinking?